It’s no secret that I’m not a morning person. Lately, though, I’ve been waking up at four AM to go to the gym with the Soldier, and it kind of pisses me off. Yes, exercise is necessary at my age. But, let’s be real, I’m already married, I don’t need to look good anymore. He’s trapped. The only reason I do work out is because I want to eat. And I want to eat well. 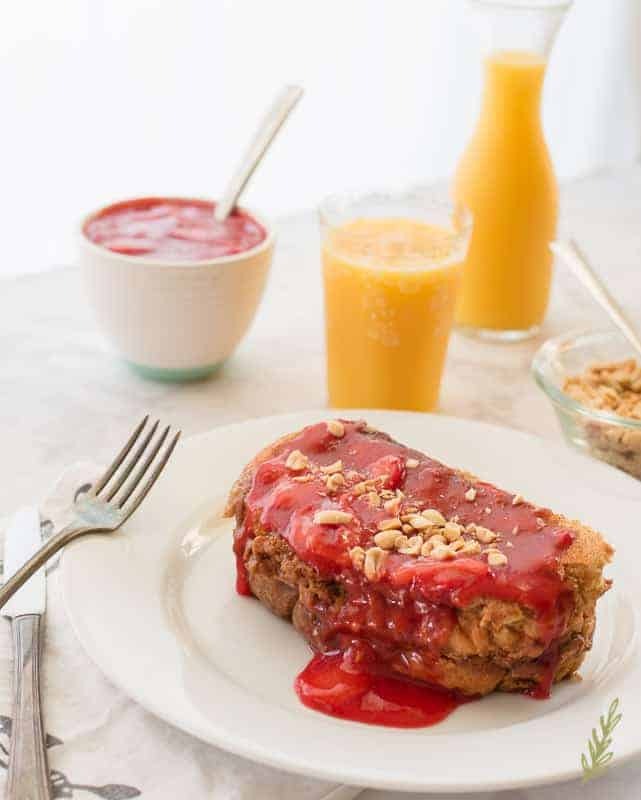 So, this Peanut Butter and Jelly Stuffed French Toast is right on par with my regimen. 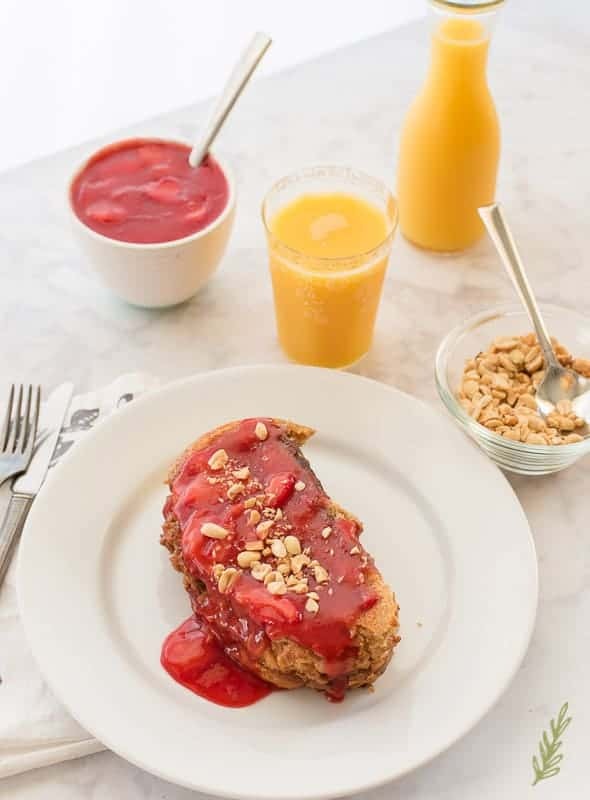 Now, this french toast isn’t truly stuffed with peanut butter and jelly- it’s stuffed with peanut butter and topped with a “jelly-esque” sauce. Same difference. It’s still an amazing, kid- (and adult) friendly breakfast recipe. Peanut Butter & Jelly is a kid’s paradise! Well, if they’re not allergic, it is. If you have a peanut allergy in your home, you can substitute the peanut butter in this for your favorite butter. I’ve tried this with almond, cashew, coconut, and nutella- all were just as delicious. I’m blessed in that none of my family members have food allergies, so I use regular peanut butter. 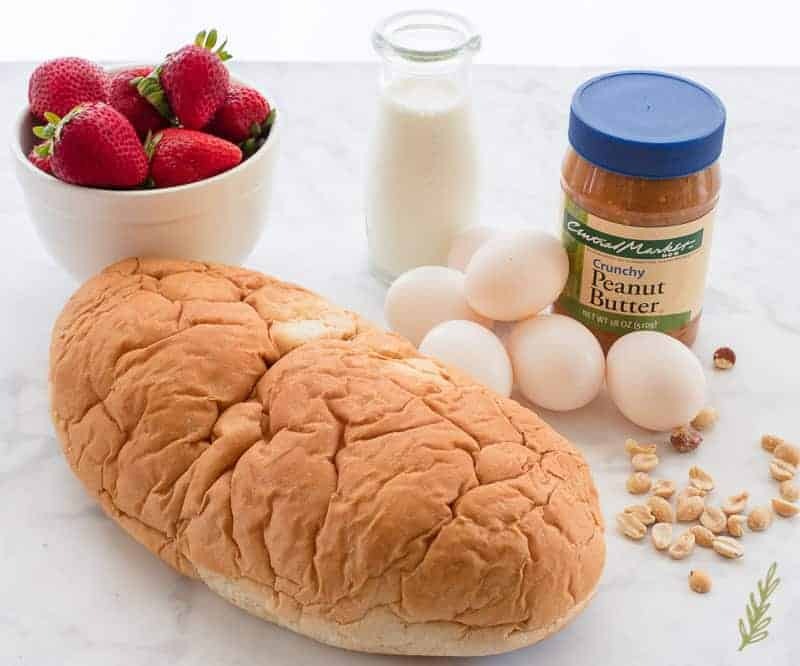 In addition to the PB, you’ll need a pound of fresh (or frozen) strawberries, eggs, half and half, and loaf of bread. I’m using my Pan Sobao for this recipe. You can also use brioche, challah, or a soft Italian bread. Avoid using regular sandwich bread (unless it’s Texas toast) as it will get super soggy and fall apart. Day old bread that’s a little stale is perfect because it soaks up the custard beautifully. Before you stuff the bread, you’ll need to lightly grease a large casserole dish. In order to stuff our french toast, we need to cut the loaf on our cutting board using a serrated bread knife. A serrated knife helps to avoid tearing, or ripping, the bread. You want two inch thick slices. From a pound and a half loaf of bread, you should be able to get five or six pieces. Once you have your two inch thick pieces, make another cut in the middle of the slice. Think of it as making a pocket. 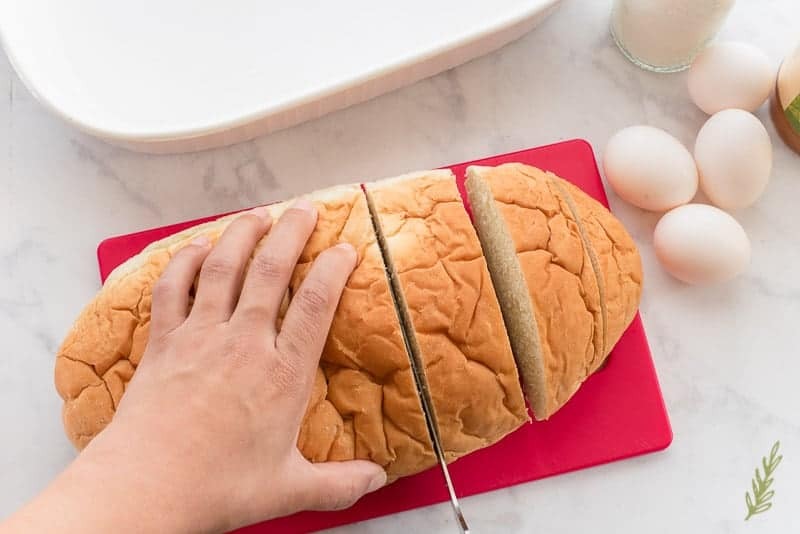 You’re not separating the slice, nor are you cutting all the way through. Cut only three-quarters of the way through the slice to make the pocket. Using a one and half to two ounce portion scoop fill the pockets with two scoops of the crunchy peanut butter. 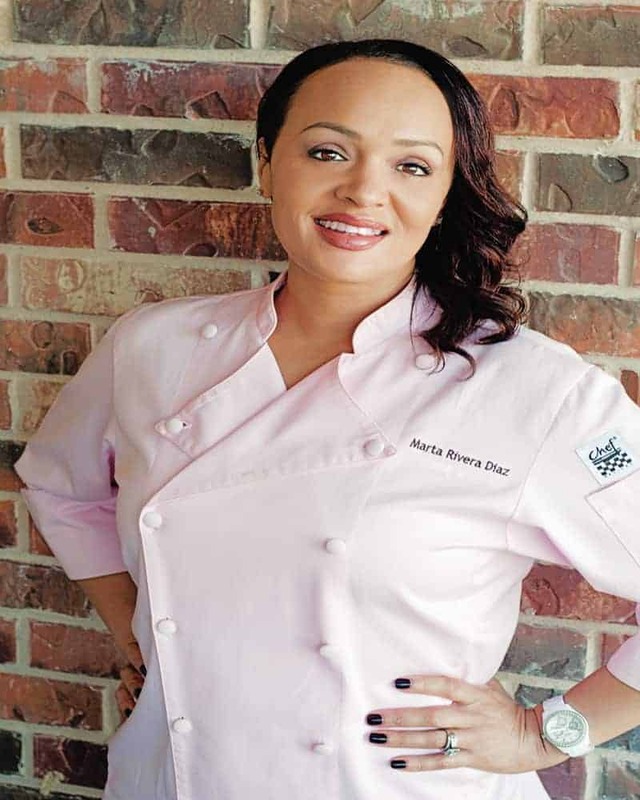 I use crunchy peanut butter because I love the added texture it gives to the dish. Smooth butter is perfectly fine to use in its place, though. Set the stuffed bread slices in the casserole dish. The peanut butter may, or may not, seep out a little. Don’t worry about that. Set the casserole dish to the side while you prepare your custard. Make the French toast custard. 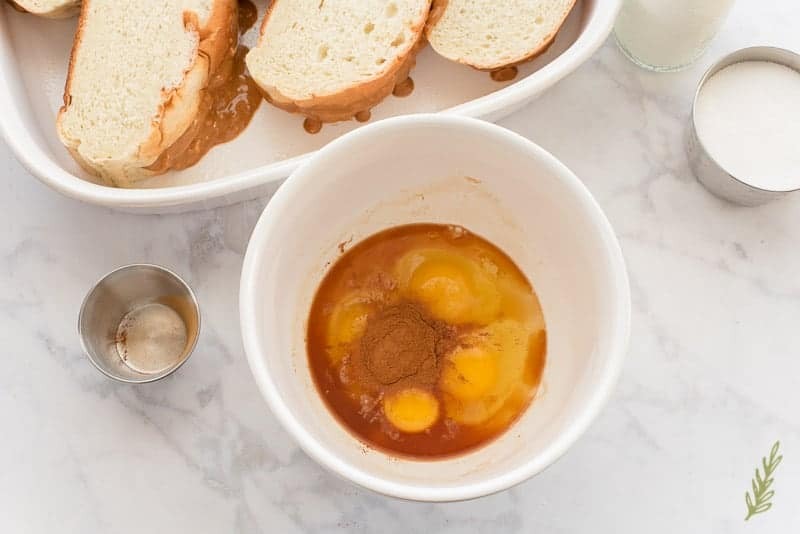 Place your eggs in a mixing bowl, then add the vanilla extract, ground cinnamon, and a pinch of kosher salt. 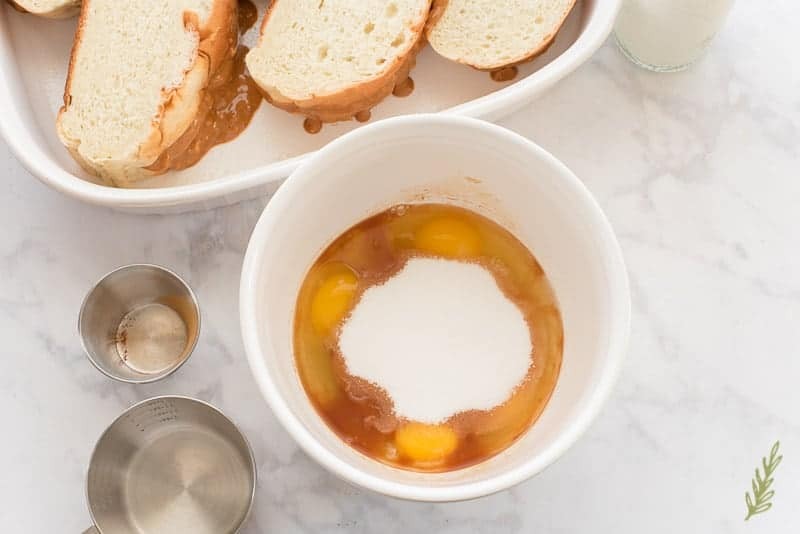 Add the granulated sugar to the bowl and whisk everything together until the eggs are beaten and the mixture is smooth. Slowly, add the half and half and stir it all together until smooth. 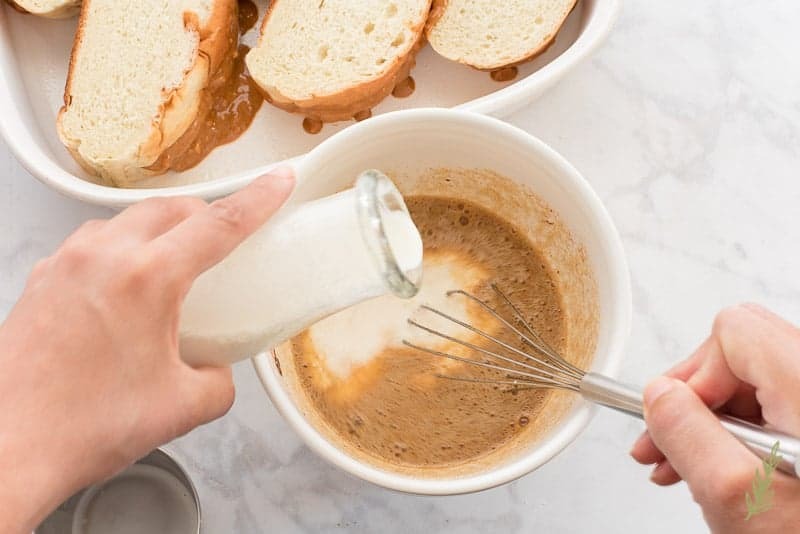 Pour this custard over the bread you have in the casserole dish. At this point you can cover it with aluminum foil and refrigerate it anywhere from eight, to ten, hours. 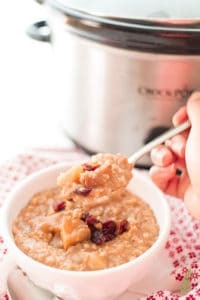 This is great if you want a warm breakfast on a busy morning without the rush of making it that day. If you want to eat it the same day you make it, just allow it to sit from thirty minutes to an hour to allow the bread to soak up the custard. If you are pressed for time, you can allow it to soak for a minimum of fifteen minutes. Just be mindful that the bread won’t soak the custard up fully and you may have excess custard baked around the bottom of the french toast. It’ll still taste hella good, though. Once your french toast has soaked for the desired amount of time, place the dish into an oven that’s been pre-heated to three hundred and fifty degrees. Make sure that you first allow the dish to warm up a little on the counter, prior to putting your dish into the hot oven. You risk exploding the dish if you place it into a very hot oven while it’s still cold. Leave the aluminum foil cover on the dish and bake for thirty minutes. After thirty minutes, carefully remove the foil and bake for an additional fifteen minutes. Prep the strawberry “jelly” topping. 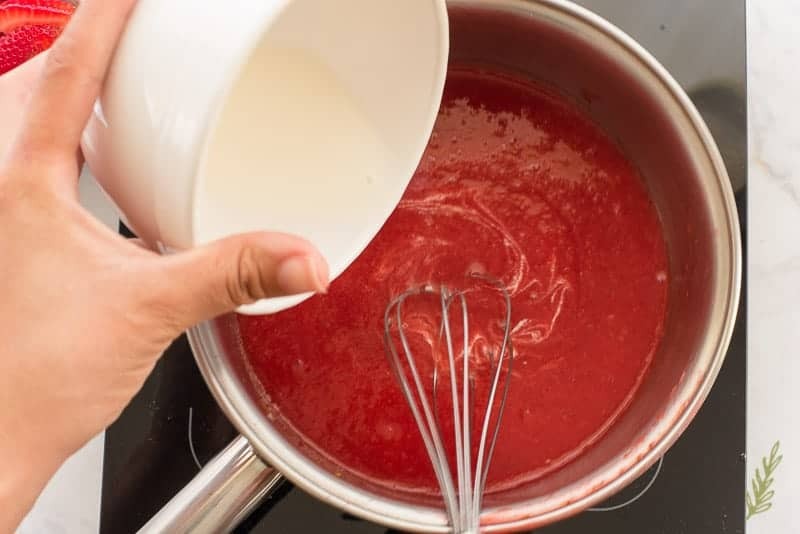 While your bread is baking, prepare the ingredients needed for the strawberry jelly topping. This is actually a jam since we’re not adding pectin or gelatin to it. However, “peanut butter and jam” doesn’t sound as good as peanut butter and jelly- so I’m taking artistic liberties. Jams are made from fruit, sugar and water. I’m adding cornstarch and grated orange peel to the mix, too. The former is for thickening the jelly, the latter for an added dimension of flavor. 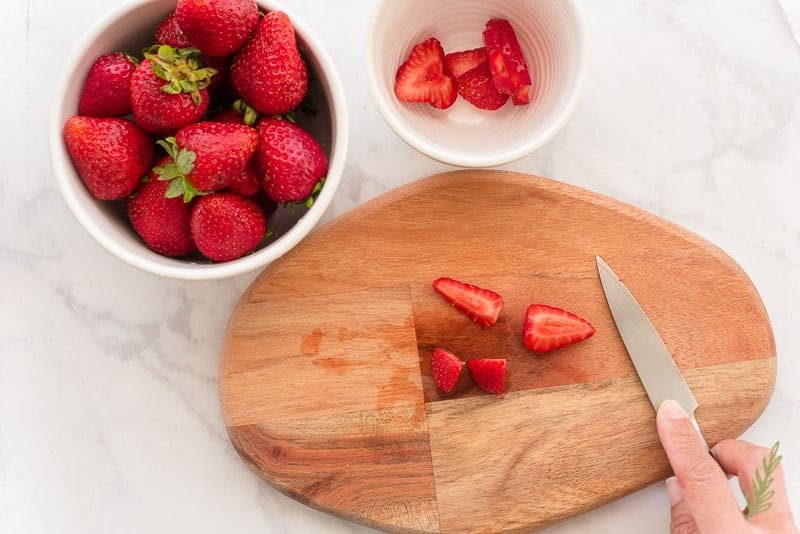 Hull and slice your strawberries using a paring knife. Set aside a quarter of the sliced strawberries for stirring into the finished jelly. Make your cornstarch slurry in a separate smaller mixing bowl. Just combine the cornstarch and cold water, then stir this together until the mixture is free of lumps. Set this aside. 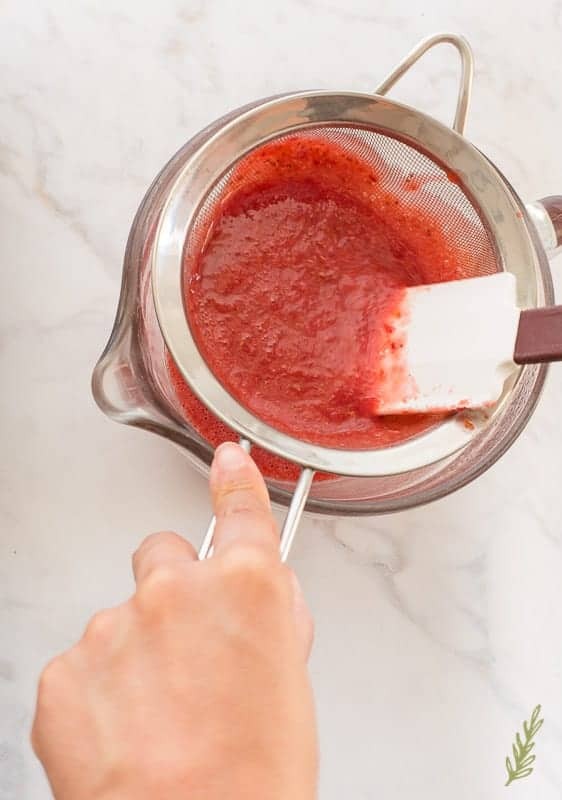 In a sauce pan, combine the larger quantity of the sliced strawberries, the water, granulated sugar, and orange zest and bring this to a boil over medium-high heat. Cook for five minutes, or until the berries start breaking up. 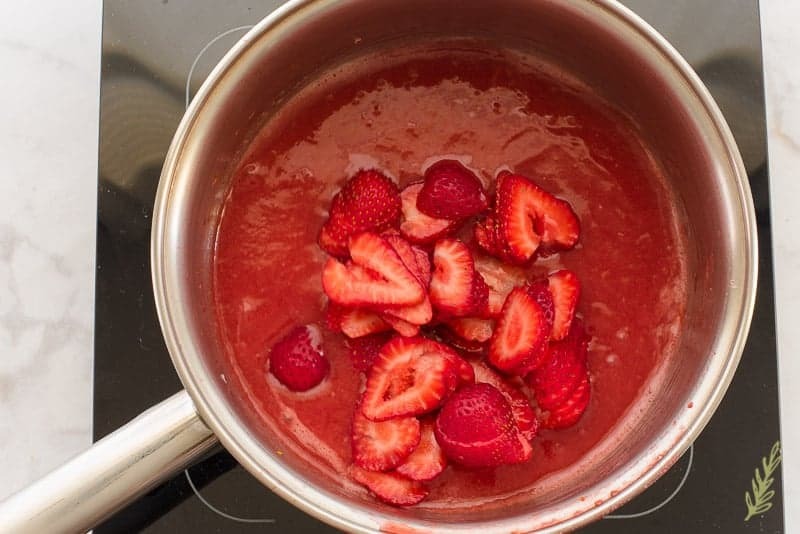 Once the berries have cooked for five minutes, use an immersion blender to blend the strawberries smooth. Strain the berries through a fine mesh sieve to remove the seeds. A rubber spatula helps to push the juice through the strainer, if needed. Return the strained berries to the rinsed out pot (which eliminate the seeds that may remain). Drizzle the cornstarch slurry into the berries in the pot, whisking constantly. Bring the mixture to a simmer over medium heat, whisking while it heats. You’ll see the berry mixture begin to thicken after two, or three, minutes. The bubbles will resemble lava as they break the surface of the jelly. Once they look like that, it’s time to remove the pot from the stove. Fold in the reserved strawberries and transfer the jelly to a serving bowl. Set this aside for topping the baked french toast with. Once your bread has finished baking, remove the pan from the oven and allow it to cool for five to ten minutes. I use this time to set the table and pour drinks…and yell at people to hurry up- remember, I’m mad about the gym. Once I’m ready to serve, I spoon the strawberry jelly over the top of the french toast. You can leave the bowl out for your family (or guests) to serve themselves. No need for any other topping except some chopped and toasted, unsalted peanuts. This dish is best served the day it’s made, so dig in! Pin this recipe for later and share with your friends! This dish can be made a night ahead for easy prep in the morning! Lightly grease a 9"x13" casserole with the melted butter. If you are baking this the same day, preheat your oven to 350°F. 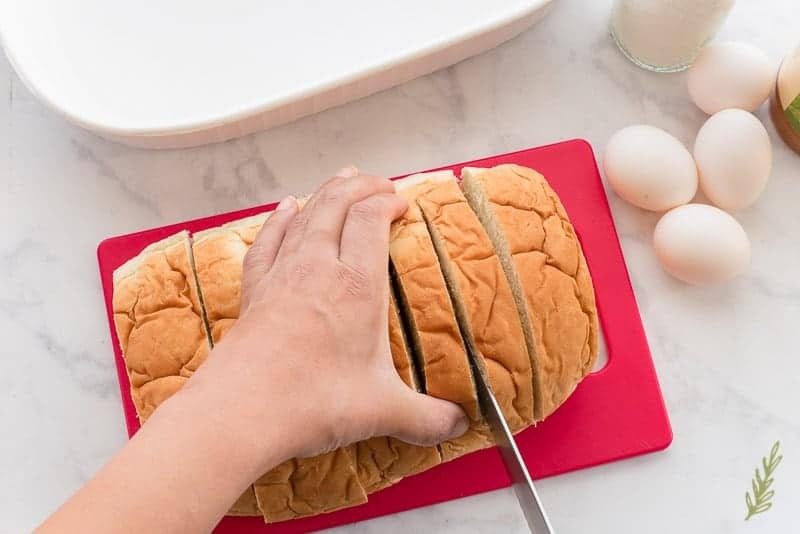 Using a serrated bread knife, slice the bread loaf into 6 equal slices, each approx. 2" thick. Make another cut in the middle of each slice, about 3/4" deep- creating a pocket for the peanut butter. 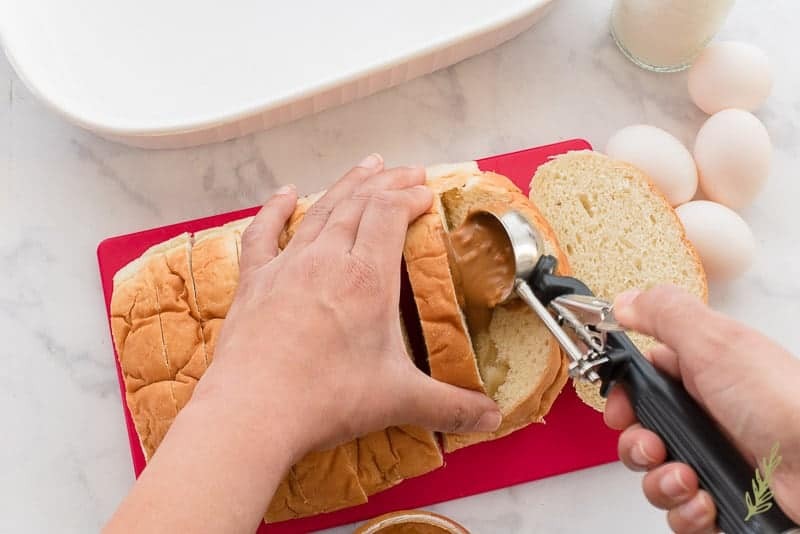 Using a 1 1/2-2 oz portion scoop fill the pockets with 2 scoops of the peanut butter (you may also use a 1/4 measuring cup). Arrange the stuffed bread slices in the casserole dish, and set aside while you prepare the custard. Whisk together the eggs, vanilla extract, ground cinnamon, kosher salt, and a 1/4 cup of the granulated sugar in a large mixing bowl. Stir until the eggs are beaten and the mixture is smooth. Pour the custard over the bread you have in the casserole dish. At this point you can cover it with aluminum foil and refrigerate it anywhere from 8, to 10, hours. If you want to make it now, allow the bread to soak up the custard for at least 30 minutes. Place the dish into an oven and bake, covered, for 30 minutes. After 30 minutes, carefully remove the foil and bake for an additional 15 minutes. Set aside a quarter of the sliced strawberries for stirring into the finished jelly. Stir the cornstarch and cold water together in a small mixing bowl until no lumps remain. Set this aside. 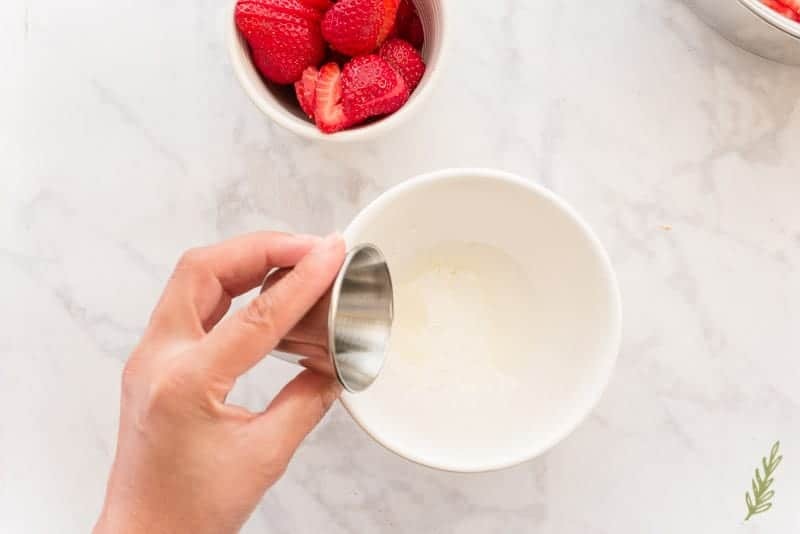 In a 2 qt sauce pan over medium heat, combine the larger quantity of strawberries, water, the remaining sugar, and orange zest and bring this mixture to a boil. Cook for 5 minutes, or until the berries start breaking up. 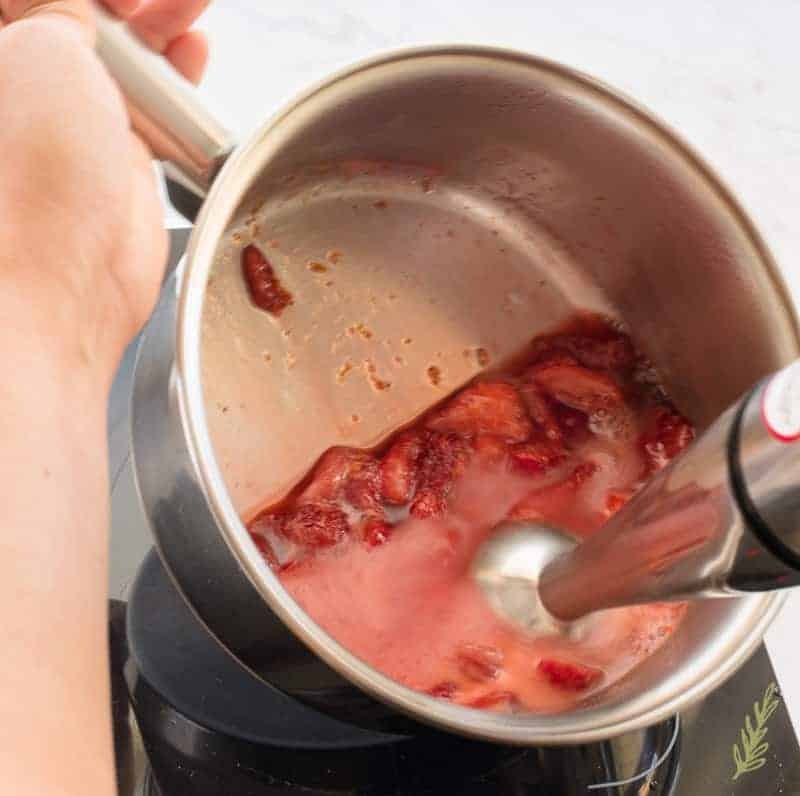 Once the berries have cooked for 5 minutes, use an immersion blender to puree the strawberries until they're smooth. Strain the berries through a fine mesh sieve to remove the seeds, and rinse the pot of any seeds. Return the strained berries to the clean pot and drizzle the cornstarch slurry into the berries, whisking constantly. Bring the mixture to a simmer over medium heat, whisking while it heats. The berry mixture will begin to thicken after 2, or 3, minutes. When the bubbles resemble lava as they break the surface of the jelly, the jelly is done. 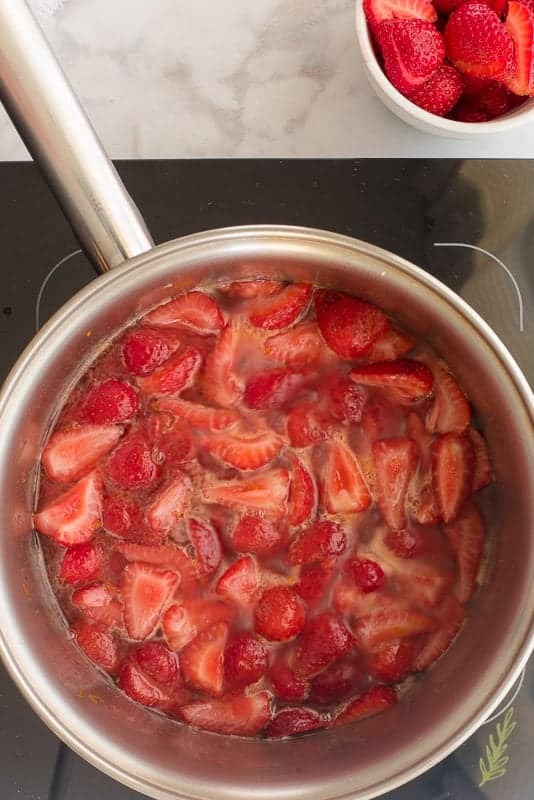 Remove the pot from the stove and fold in the reserved strawberries. 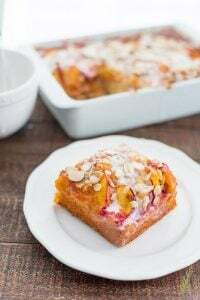 Transfer the jelly to a serving bowl, then set aside for topping the baked french toast later. Once the french toast has finished baking, remove the pan from the oven and allow it to cool for 5 to 10 minutes. 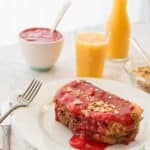 Spoon the strawberry jelly over the top of the french toast, or serve the jelly on the side. Garnish with additional chopped peanuts, sliced bananas, maple syrup, or powdered sugar. This dish is best served shortly after baking. If you're using frozen berries, thaw under refrigeration prior to using. Save any juice from the thawed berries to use in making the jelly. When using the "next day" option, make sure that you first allow the dish to warm up a little on the counter (prior to putting your dish into the hot oven). The dish may explode if you place it into a very hot oven while it's still cold. Need some kid-friendly morning meals? Right!?!? It’s so much better than a plain ol’ PB&J! 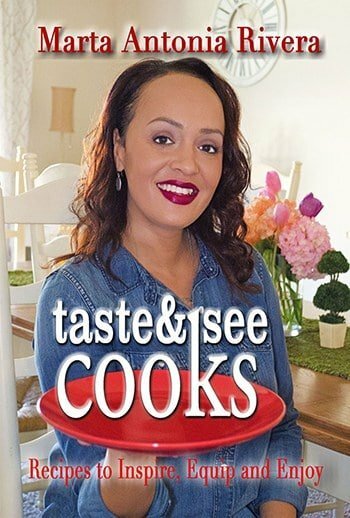 This recipe looks so delicious I can’t, such a tasty treat! Thanks, Paula!I hope you try it and love it! This looks so yummy! It’s nice to have some different ideas for breakfast, especially for special occasions. I agree! This is great for a crowd if you double it! It sure makes my day a lot better when I have it for breakfast, Karen! Wow, this looks like something I need to try right now! It’s like a fancy version of pb&j (which is still one of my favorite flavor combos). I’m really excited about trying this! Yes, Christa! It’s a glammed up version of the original! Wow, this is a breakfast fit for a queen! I love how it combines all of my favorite childhood flavors in an elegant breakfast dish. And aren’t we all queens!?!? We are more than deserving of this, Vicky! YES! My son loves french toast, this is something he would love. He also loves peanut butter too. Oh, this will be perfect for him, Evelyn! Ooooh! This looks so yummy! I love pb &j and French toast- this is perfection!